Woo hoo! A hundred new trial users signed up to your application. Do you celebrate? Not yet. I want to explain the benefits of customer onboarding for SaaS (software as a service). Signing up for a trial is obviously a long way short of the finish line. Converting these trial users to paid subscribers is a clear next focus. But even paid users aren’t over the line yet, either. The moment of purchase or trial is just the start of a mini journey. We need to get the user to the next incremental value as fast as we can. That’s the role of a customer onboarding sequence for your SaaS application. We’ve just implemented a series of emails for onboarding customers, and early results suggest a 400% improvement in engagement. I suspect that once we get larger numbers of users into the program that will back off a bit, but it’s a great start for a relatively low cost. 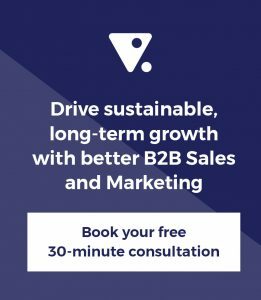 Like most SaaS businesses, our Funnel Plan is offered as a free trial and a paid upgrade – the so-called ‘freemium’ model. Most freemium implementations for SaaS offer the whole product for a limited time. However, we can’t. Most of the value of a planning application is enjoyed up front and so the urgency to upgrade would be missing. So we offer limited functionality during the trial, but allow users to enjoy it for an unlimited time. 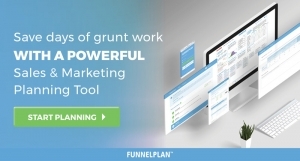 We baked enough value into the free plan so that a business wanting to build a sales and marketing plan can quickly do so using the free version of Funnel Plan. We then added enough value (more functionality, unlimited free coaching) into the paid product so that some of these trial users would upgrade at some point. Before we had our onboarding emails, users enjoyed a lot of help and onboarding inside the application. Let me show you what we offered, but you’ve already sensed that I’m going to explain later why this wasn’t enough. On first login, users are greeted with a great welcome that pops out, offers text, image and video. Users can engage with a human using a chat-like dialogue box. Every page has its own welcome that offers quick tips and explains how to go a little deeper. Animated gifs show the user the context of the information they’re being asked for, and where their answers will end up in the completed Funnel Plan. Velocity is your 2nd last step and is a critical component of your Funnel Plan. This is where you calculate how long it takes to convert an opportunity to a sale. So why isn’t in-app onboarding good enough? Think about your own experience. You discover a cool new tool, you read the sales page, and you agree to buy (or trial). After completing the (hopefully) limited information needed to sign up, you get all your welcome emails, and you open the app and have a play. Great! But maybe you don’t have time to go all the way to that first value mark right now. So you’ve spent a little time, but haven’t yet got the real value that’s been promised. No worries, you’ll come back tomorrow and get that first outcome. But tomorrow is a train wreck. Meetings run overtime, you have a client with issues you hadn’t factored in, there are staff interruptions, etc. So you just never go back. In-app onboarding doesn’t help the user – you in this case – or the provider who wants to earn the right to offer the next increment in value (for a fee), because you never log back into the app. At least that was our experience. We needed a way to constantly bring users back so they had a much better chance of getting the value we promised them in the first place. What chance have we got of selling a paid plan if the free one doesn’t deliver? And that’s why we built a series of customer onboarding emails for our SaaS application – Funnel Plan. They rapidly follow that first welcome email to bring the user back as often as they need. In this way, they get their first integrated sales and marketing plan built, printed, and up on the wall. Half of our trial users in November received our usual welcome email and great in-app support. The other received these benefits, and then received a series of onboarding emails explaining how and why to address each question. We sent one email a day for 9 days so we could break the planning process down into a manageable process and not overwhelm our trial users. Although we could have measured engagement by time on page or pages visited, the analytics on that got a bit weird as we don’t track page visits per individual user. So we decided to measure engagement by the number of logins after registration. We found that the simple addition of an onboarding sequence increased user engagement by 400%. If SaaS is more engaging with onboarding, why not use it for all forms of service? Think about it. What normally happens if you hire a professional consultant? What’s their onboarding sequence look like? Certainly, some event organisers have a decent process for their paid events, but why do we stop there? Imagine getting a welcome email, followed by a series of emails that start to prepare you for each next step. What impression would you have of that service delivery? A testimonial video from a former customer who took the journey. Perhaps focus here, on their journey and not the end point. We want them to be excited about starting, not finishing. I could keep going, but you get the idea. I hope that our early experience with customer onboarding, for SaaS, has highlighted a potential new path for you to increase the value enjoyed by your customers when they buy your products or services beyond SaaS.